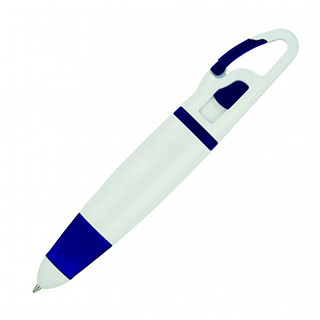 Practical, commonsense and useful, the Carabiner Ballpoint Pen can be clipped wherever it is needed. Printed with your promotional logo, brand or personalization this retractable black inked ballpoint will carry your message to the front line. Quality refill with 1.0mm nib and 600m capacity. White/Blue colours.